A diaper (in North America) or nappy (in the United Kingdom or Commonwealth countries) is an absorbent garment worn primarily by whom are not yet potty trained or suffer from bedwetting. The purpose of a diaper is to absorb moisture and contain mess so that the wearer can remain dry and comfortable after wetting or soiling themselves. When diapers become full and can no longer hold any more waste, they require changing. Why and Benefits of Using Cloth Diapers? •More Economic-- Yes, cloth diapers are cheaper than disposable. Any way you do the math, cloth wins. Please click here to view cost calculation between disposal diaper and cloth diaper. Question: How much more other things you can buy for your beloved children with RM 3,194? •Environmental Friendly. Cloth Diapers are more environmentally friendly! Cloth diapers can be wash, reuse and recycle. With cloth diapers you are not throwing thousands of pounds of non-biodegradable waste into the landfills each year.Cloth diapers should be the Reduce, Re-use, and Recycle product of choice! It only takes 3 dozen good quality cloth diapers to diaper at least 2 children for a grand total of 4-6 years, then you can use the worn diapers as rags for another 5 years, then you can throw the scraps in the compost bin, where the natural fibers will biodegrade. •Health Issue.Disposable diapers contain Carcinogenic Dioxin, which in various forms has been shown to cause cancer, birth defects, liver damage, and skin diseases, genetic damage, is a by-product of the paper-bleaching process used in manufacturing disposable diapers, and trace quantities may exist in the diapers themselves. Disposable diapers contain gel-like beads Sodium polyacrylate, make diapers super absorbent. It ‘pulls’ natural moisture from baby’s skin, encouraging irritation. It can cause severe allergic reactions including vomiting, infections and fever. Disposable diapers also contain TRIBUTYL TIN – Highly toxic pollutant. It has hormone-like effect in smallest concentration. It harms the immune system and impairs the hormonal system. •Earlier toilet training.This may not hold true in every case, but there's no denying that cloth diapers are a lot more "realistic" than disposables. A wet cloth diaper feels wet to a child, whereas a disposable diaper continues to feel dry. •Less diaper rashes. No doubt, it may depends on the child, but that cloth seems to maintain a better moisture environment for my daughter's skin than disposables. You can also feel more easily when your child is wet and change her as often as necessary. And there's no increased cost if you need to change your child more often with cloth diapers, whereas with disposables it can really add up if you are changing your babe more frequently due to rash or diarrhea. One study from the Journal of Pediatrics indicates that 54% of one month olds in disposable diapers had some type of rash, 16% were severe. Rash medication can be expensive. A tube of one of the leading makers of rash medicine costs approximately $6. This is just a small expense, but multiply that expense over three years and it quickly starts to add up. · No midnight runs to the store because you are out of diapers, no scanning newspaper ads, hoping for a great sale, and no clipping coupons. Just do a couple loads of laundry a week and you're set! KS One Size Pocket Diaper. 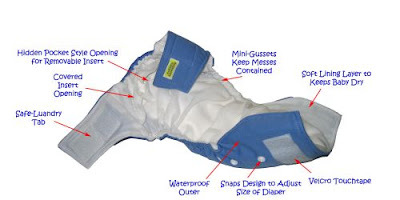 The snap setting allows the diaper to grow from small, medium to large. Plus a cross over tab is in place to give the diaper a perfect fit.Two one-size microfiber inserts, come with this diaper to make it complete. These diapers have an inner flannel lining for comfort on baby's tender toosh! A sewn in waterproof layer of Polyurethane Laminated (PUL) to prevent leaks and messes outside of the diaper! A sewn in elastic around baby's leg's and at back to help prevent any "messy" leaks! way to fasten the diaper. An adorible outer /polyester layer to make baby look cute in an assortment of patterns. •Made from 3 layers of micro fiber terry cloth.